DELTA, B.C. – Eriez Flotation Division (EFD) has just released a new white paper titled “A New Paradigm in Sulfide Processing,” written by Mike Mankosa, Ph.D., executive VP of global technology. This special report explores a split-feed circuit developed by EFD which was specifically engineered to extend the particle size range for sulphide flotation beyond what is achievable using current technology. 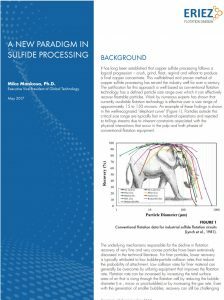 Download the new, free white paper from Eriez to improve sulphide processing. It has long been established that copper sulphide processing follows a logical progression – crush, grind, float, regrind and refloat to produce a final copper concentrate. Today, it is becoming more important for mining companies to challenge conventional recovery approaches. EFD’s solution for improved recovery in sulphide processing incorporates two novel flotation technologies: the HydroFloat separator for coarse particle recovery (>150 microns) and the StackCell to improve fine particle recovery (<15 microns). The white paper provides background information and offers a comprehensive overview of coarse particle flotation, fine particle flotation, incorporation of this technology for copper sulphides, primary concentrator applications and tailings retreatment. It concludes by explaining that extensive testing of the Eriez hybrid flowsheet has demonstrated success extending the traditional particle size range for sulphide flotation while also increasing plant capacity and reducing power and space requirements. To download “A New Paradigm in Sulfide Processing,” visit http://EriezNews.com/nr431. To access additional EFD white papers and product brochures, go to https://www.EriezFlotation.com/resources/.